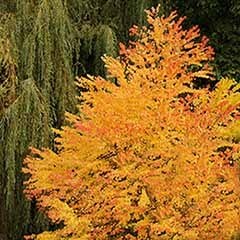 Bright yellow and green leaves held on red stems make this a garden gem! 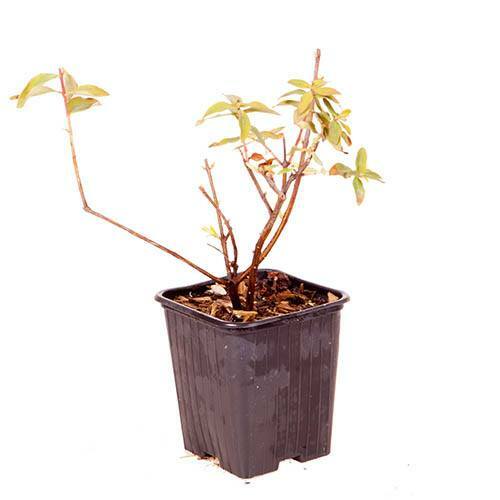 Hypericum moserianum 'Little Misstery' is a much sought-after, new form of Hypericum (St John's Wort) and we're delighted to be one of the first to be able to bring it to you. 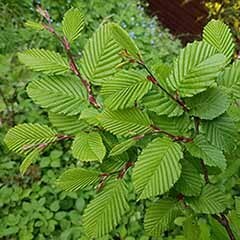 'Little Misstery' bursts into life in early spring with a flourish of lush green leaves edged in butter yellow, held on raspberry-red stems - truly a sight to behold. 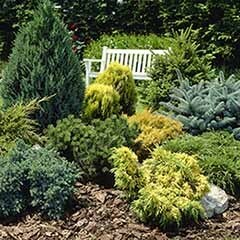 A flower arranger's dream (and a gardener's for that matter), the striking variegation remains throughout the growing season, followed from July to October by masses of bright yellow flowers. 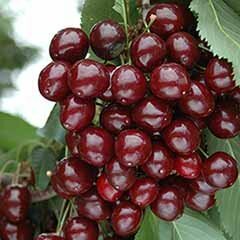 The fruits provide even more interest in the garden and make a great addition to flower arrangements. 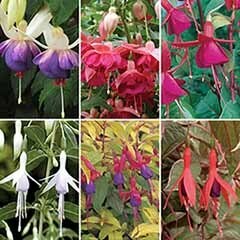 Supplied as an established young plant in a 9cm pot, ready to be planted out or potted up. 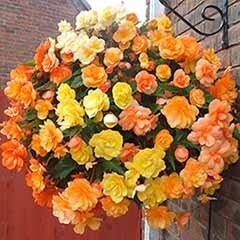 With an ultimate height and spread of 0.3m (1ft), it'll light up your garden for months! 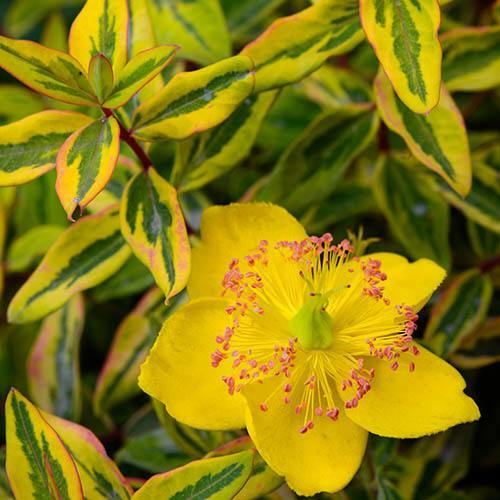 Hypericum moserianum 'Little Misstery' is a much sought-after, new form of Hypericum (St John's Wort) and much prized with flower arrangers for its pinkish-red fruits. 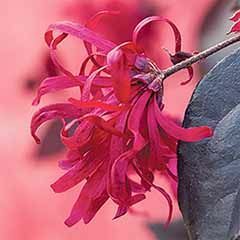 Another plant that's really quite difficult to find, we're delighted to be one of the first to be able to bring it to you. 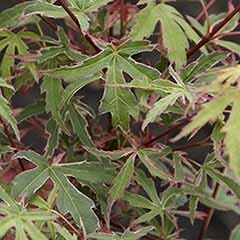 Perfect for a sunny or part-shaded position, 'Little Misstery' bursts into life in early spring with a flourish of lush green leaves edged in butter yellow, held on raspberry-red stems - truly a sight to behold in the spring garden! 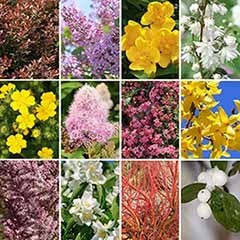 A flower arranger's dream (and a gardener's for that matter), the striking variegation remains distinct throughout the growing season, and the leaves are followed from July to October by masses of bright yellow, cup-shaped flowers beautifully enhanced by a contrasting fringe of red anthers. 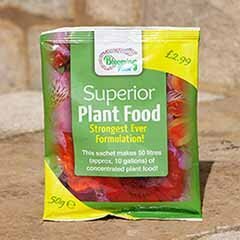 Bees and many other beneficial pollinating insects find Hypericum Little Misstery irresistible and the resulting fruits provide even more interest in the garden and make a great addition to flower arrangements. 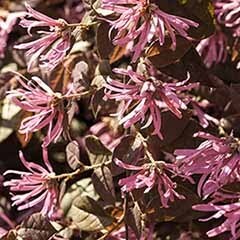 Grow in moist but well-drained soil in sun or part shade. 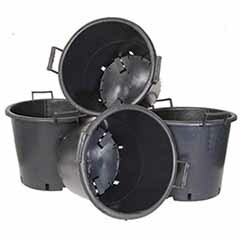 To plant, water your potted shrub well and allow to drain. 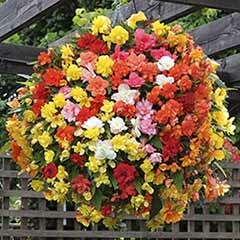 Dig a hole a little deeper and 3 x wider than the nursery pot. 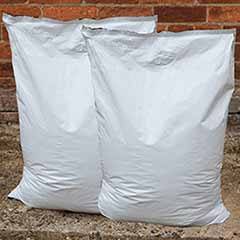 Add a conditioner such as well rotted manure to the earth removed from the hole if necessary. 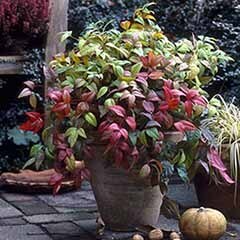 Once established, Hypericum is low maintenance and needs little or no regular pruning. 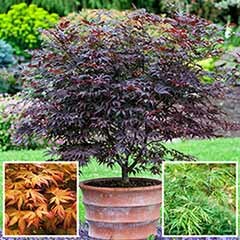 If necessary, remove any dead or damaged branches in mid to late spring.